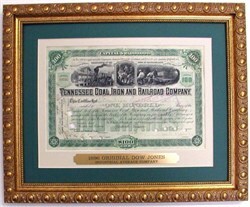 Beautifully engraved, scarce certificate from the Tennessee Coal, Iron & Railroad Company issued in 1898. This company was one of the twelve original 1896 Dow Jones Industrial Average Companies; thus, making this certificate very desirable and collectible. This historic document was printed by the American Banknote Company and has an ornate border with a triple vignette of a train and men working in a mine. This document has the hand signatures of the company's president, N. Baxter, Jr., and secretary, John F. Fletcher. The certificate has been punch cancelled through the signatures and is in EF condition. In 1881 the Tennessee Coal & Railroad Company was renamed the Tennessee Coal, Iron and Railroad Company. The company was one of the largest industrial firms in the Birmingham area. Ultimately, the company was acquired by U.S. Steel in a 1907 merger approved by Teddy Roosevelt when he was tricked during the panic by J.P. Morgan. The certificate is shown in an ornate, antique gold finish classic frame. The wood moulding is 1 1/4" wide with an overall frame size of 13 1/4" x 16 1/4". Double matting is used with an engraved, brass plate stating "1896 Original Dow Jones Industrial Average Company". Archival mounting, acid-free backing, and clear glass are used in preparing the framed certificate. The price includes the historic certificate, framing as described above, labor, heavy duty packaging, and USPS Priority Mailing in the continental United States. Mailing to Alaska, Hawaii, and international destinations is available at actual cost.